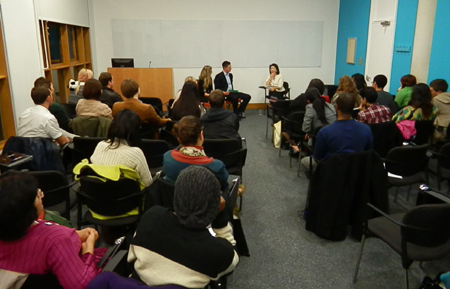 The 'Evening With' Professor Akiko Yamanaka was held on Tuesday 23rd October at SOAS, University of London. Professor Yamanka is a visiting professor at Cambridge University. Whilst being an accomplished academic, Professor Yamanaka was able to become a high ranking official in the Liberal Democrat Party of Japan. She rose to be the Vice-Minister of Foreign Affairs in Japan (2005-2006), and is currently a Professional By-Fellow of Churchill College, Cambridge University and Visiting Professor at the Science Academy of Chiba University of Commerce. She is Member of the Advisory Group on International Peace Cooperation for Japan’s Ministry of Foreign Affairs, Advisor for Research of the Japan Institute for International Policy Studies and Board Member of the Global Partner Forum 2010. Professor Yamanaka has held numerous academic positions throughout Japan including at the United Nations University and Hokkaido University, in addition to international postings in Germany, Sweden, Russia, the United States and the United Kingdom. 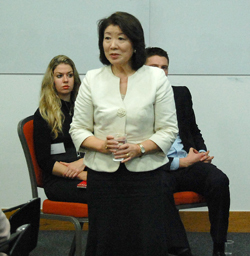 She has had a long-term presence in the National Diet of Japan as Member of the Committee on Foreign Affairs, specialising in diplomacy, security issues, peace building and crisis management. She holds the OISCA Award in recognition of her contributions to Asia and has also been awarded the International Soroptimist Japan’s “Sen Kyoko Prize” for her contributions to international understanding. Professor Yamanaka shared how difficult it had been to make the career path changes from being an academic to being a politician and then back to being an academic. It was more of a challenge that she was making this career as a women among many men. She shared that once elected there was great pressure on her to keep quiet as a politician. She was told to toe the party line and allow more senior colleagues to comment and lead the political arguments. However, she quickly realised that she may not be in politics for long so she better speak out whenever she had something to say. As an academic she understood also that senior colleagues were not always using the best political arguments in debates over policy! She became well known as an articulate politician. She was able to become Deputy Foreign Minister without bowing to this pressure. She commented that the balance of family and work forced her to get up very early to prepare for each day. Often rising at 4:00 am she was able to organise her daily schedule and despite the great pressure. Youth UPF (Universal Peace Federation), is a body of young adults who recognise the potential of young people to positively influence society and seeks to empower young people with the necessary leadership and personal skills to do so. We are currently holding a series of events in which we conduct a live interview with successful social activists in order to understand what motivates them to do what they do and to give valuable insights to those who attend, called " An Evening with... doing well and doing good". Right click on the links and select Open Link In A New Tab / Open Link In A New Window.